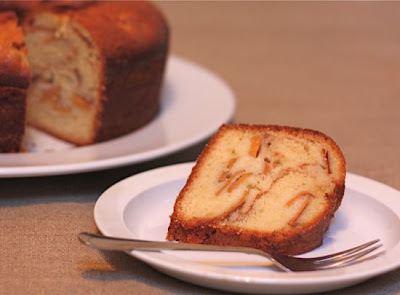 A slightly different take from all the usual suspects we might find around the Thanksgiving holiday table, this moist cake combines one of the autumn season's delicious reliables with the sweet, delicate flavour of the exotic persimmon. Hot out of the oven, this sweet treat has been described as heavenly! In a mixing bowl, cream butter and sugar together and slowly add eggs, vanilla and apple. In a separate bowl, combine persimmon pulp, lemon juice and baking soda together, then add that to the cream mixture. In a third bowl, combine flour, salt, spices and orange zest. When mixed well, blend this into the persimmon mixture. Pour into a greased and floured bundt pan and bake for 1 hour. Cool for 10 minutes, invert onto a cake plate and dust with confectioner's sugar. What a wonderful addition to the Thanksgiving table!